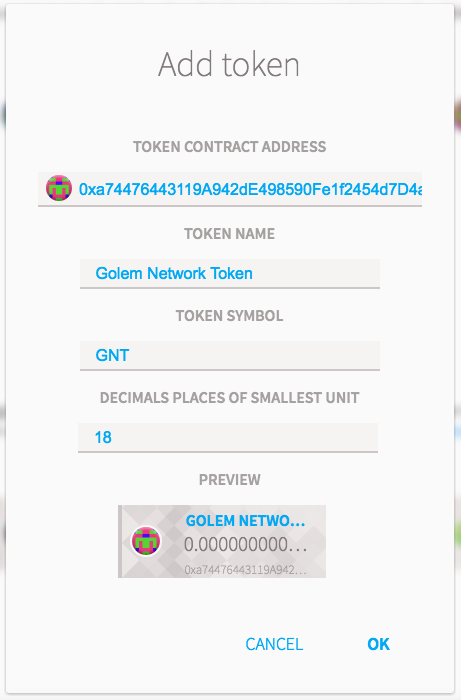 Some individuals missed out on purchasing the Golem Network Token (GNT) in the Golem Crowdfunding Funded To 820,000 ETH Cap, as the sale was over within ~ half an hour. The tokens were sold a 1 ether (ETH) = 1,000 GNTs, or 0.001 ETH per 1 GNT. I saw there was interest in a contract that sells GNT, so I made one! It sells 100,000 GNT at 2x crowdsale price. You just send ETH to it and it sends you GNT back! Be sure to check through the code and test with a small amount first! See also Trustless GNT Selling Contract on reddit.com/r/ethtrader for many more contracts. The code in this Trustless GNT Selling contract is based on user /u/JonnyLatte‘s code originally posted in Live testing ETH <-> Token, Atomic swap market to trade Augur REP tokens. Check out the first version of https://cryptoderivatives.market/, a decentralised GNT/ETH exchange contracts market. Ethereum.StackExchange.com – How do I find a list of the Golem Network Token (GNT) TokenTrader contracts? 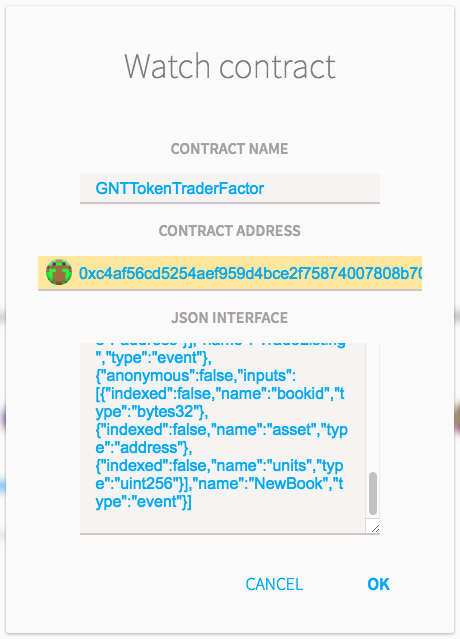 Now click on the GNTTOKENTRADERFACTORY contract in the Contracts tab. Scroll down and click the checkbox for Watch contract events. 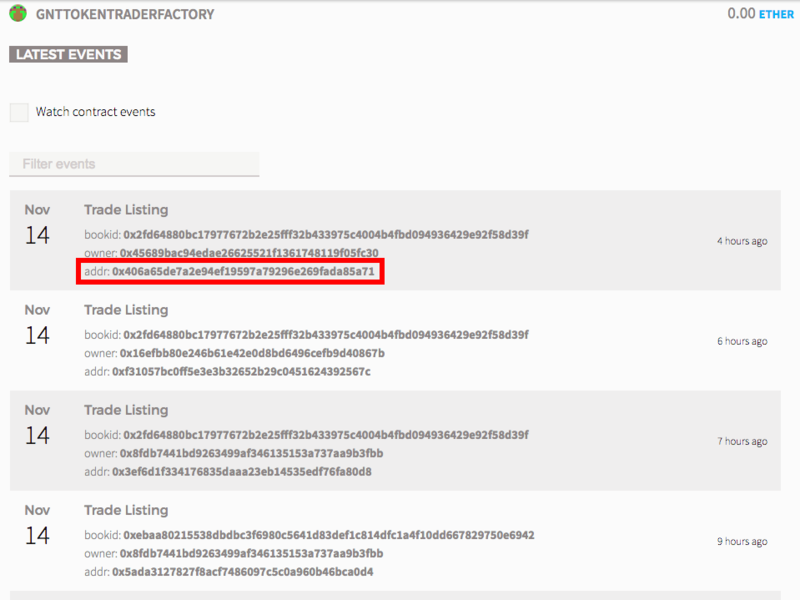 You will find the list of created TokenTrader contracts – the highlighted address is the address used in the next “Watch GNT TokenTrader Contract In Ethereum Wallet/Mist” section. 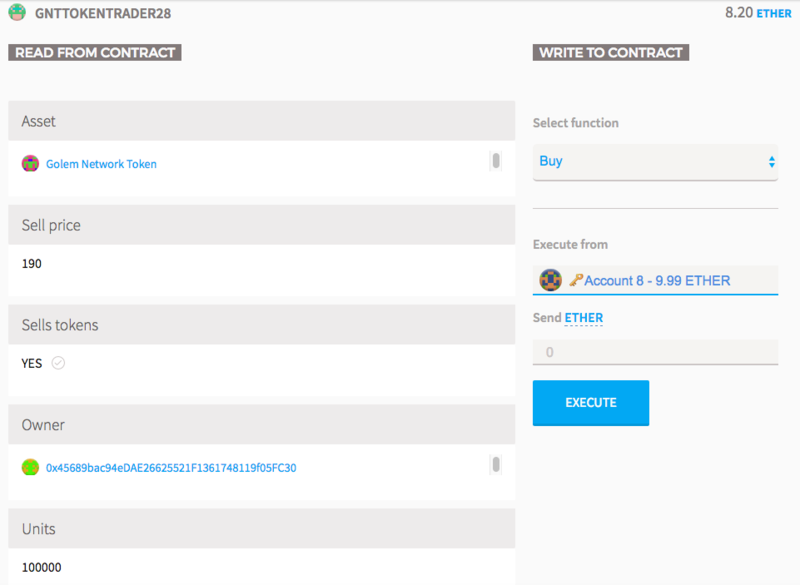 In Ethereum Wallet / Mist, click on the Contracts tab and click on Watch Contract. 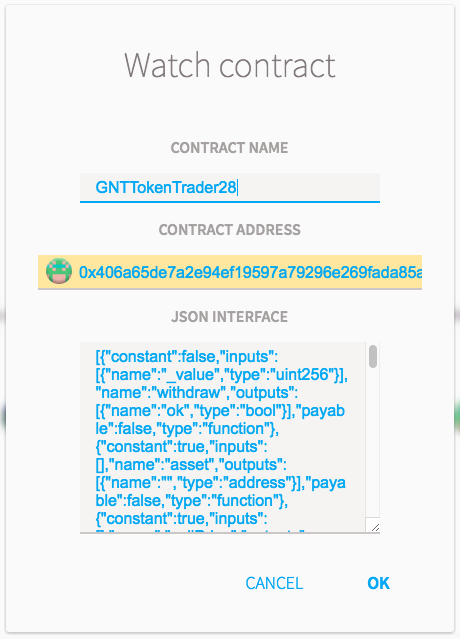 I have entered the Contract Name of “GNTTokenTrader28”, the appropriate Contract Address and add the ABI above in the JSON Interface field, then click OK.
Scrolling down the page, you will see the Read From Contract fields on the left side. You can find out the Sell Price (190 in contract #28), Units (100,000 in contract #28). The price per unit of GNT is 190 / 100,000 = 0.0019 ETH. The price per 1,000 GNTs is 1.9 ETH for this contract #28. If you want to, you can execute the Buy function on the right side of the screen – test with a small amount first. It should be fine to sell GNT however I have not tested it and it wont be able to buy GNT only sell because GNT is missing the approve() and transferFrom() functions. Since these functions are not used for selling or adding and withdrawing funds from a trade contract it should not be a problem. I have not tested this though so if you do decide to use it you should test with a small amount first. However since OP has gone to the trouble of stripping out the missing GNT functionality and is successfully selling I may as well show how to use this contract rather than my own. A trade contract holds funds and has an owner that can withdraw those funds to their account. To deposit tokens into it you just send them to its address. To withdraw them you call its withdrawToken function giving it the address of the token and the amount in that tokens smallest units. The trade contract can also sell one token called the asset at a fixed rate that is determined when the contract is created. For ease of use you can also withdraw that token using withdrawAsset which does not require you to specify the address of the token because that was already given when the contract was created. I have pasted a copy of the trade contract’s ABI which the owners of a trade contract can use to follow instances for withdrawing funds. You do not deploy a trade contract directly, instead you use a factory contract which creates an instance for you given the setup. You do that by following the factory address with the factory ABI and calling the function createTradeContract. I would suggest sticking with their choice of units and adjusting _sellPrice to fit whatever price level you want: 100 for the same price as the crowd sale 200 for double etc. If you successfully create a trade contract the factory will fire off an event showing the address and owner. You can also see them at https://etherscan.io/address/0xc4af56cd5254aef959d4bce2f75874007808b701#internaltx and then follow the one you think is yours double checking you are the owner. This entry was posted in Blog and tagged Crowdfunding, Ethereum, Exchange, Golem, Source Code, Tokens. Bookmark the permalink.